The beautiful country of Croatia has been passed between competing kingdoms in the region for many centuries. As a result, it left behind a rich cultural legacy and a unique heritage. Until the end of World War I, it was part of the Austro-Hungarian Empire. Formerly a part of Yugoslavia, Croatia gained independence in 1991. However, it took four years of bitter fighting before the Serb armies were finally cleared from the land. On July 1, 2013, thousands of Croatians celebrated in Zagreb as it became the 28th member of the European Union. Tourism is one of Croatia’s main industries. This country is a tourist haven offering over a thousand islands with the best beaches amidst ancient walled towns. It is also home to stunning national parks. Since it also has a pleasant Mediterranean climate, these factors make it a perfect holiday destination. The best time to visit is between the months of May and June and September and October. Many people are unaware that this country in the Balkan Peninsula is a splendid, geographically-diverse region. A country shaped like a crescent, Croatia has three main geographic regions. Its best geographic feature is the Croatian littoral, which is wedged between the Dinaric Alps and the Adriatic Sea. 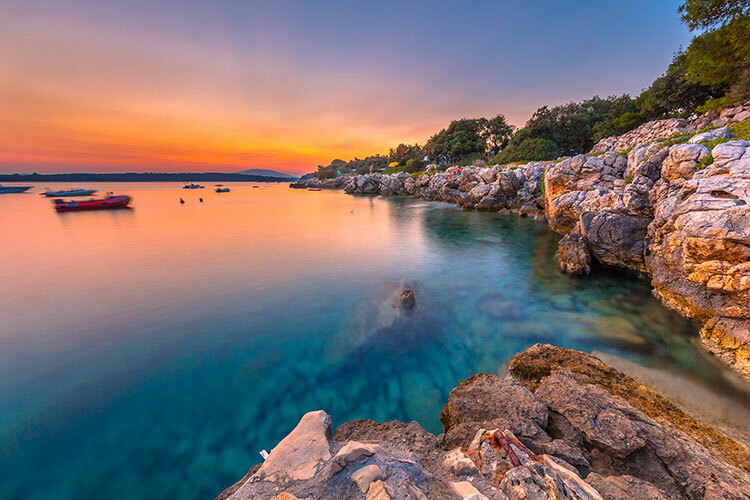 Most notably and often most surprising for many first-time visitors, Croatia has about 1,800 kilometers of coastline, which are all dotted with more than 1,100 islands of various sizes. Only 48 of these islands are actually inhabited. These islands are all very different from each other. Visitors are amazed at the variety of islands in Croatia. There are verdant islands dotted with trees, bare karst-rock islands, remote islands with just deer, and even islands with cocktail bars that attract the VIP party set. There are even islands in Croatia such as Silba, Olib, Zlarin, and Susak where cars are not allowed. There is definitely an island for each type of personality and for varied interests. There is also a diverse wealth of beaches on these islands, but the majority has blue-flag status, which guarantees water quality and safety. From holidaymakers seeking tranquility, to party-goers looking to have a good time, to toddler-wielding families, the islands of Croatia attract different kinds of people. Amazingly, about 80 per cent of the islands in this beautiful country is actually uninhabited. The long, rugged indented coastline of Croatia has many islands that have been untouched by civilization. Many visitors go to the islands on a day trip or excursion. Most islands can be reached by ferry from the mainland. Today, Croatia is one of the holiday destinations growing fastest in popularity among European travelers, attracting 1.4 million visitors in the first half of 2018. The islands are not just the main attraction in Coastal Croatia. The remarkable clarity of the water has been drawing visitors from all over the world. Set against dazzling white, pebble beaches, the waters are brilliant shades of azure, emerald, and sapphire. Each of Croatia’s islands abounds with riches waiting to be discovered. Brač is one of the bigger islands in Croatia and is separated from the mainland via the Brač Channel. In fact, it even has its own airport in its main town, Bol. Travelling from the mainland is also relatively easy, and it takes only less than an hour to do so by ferry from Split or Makarska. Although one of the more popular islands in Croatia and always packed with tourists, Brač is also filled with hidden gems if explored beyond the usual places. When you explore the interior of the island, you will discover fascinating abandoned villages. You can also find the remote Pustinja Blaca monastery here. It also boasts of having the highest mountain among the Adriatic islands, the Vidova Gora, which rises at 780 meters. Characterized by arid, rocky coastal spots, it is famous for its natural white stone, which is exported all over the world. In fact, these white stones were reportedly used to build the United Nations Headquarters in New York and the White House Building in Washington, D.C.
Croatia’s most famous beach, Zlatni Rat, is found in Brač. Zlatni Rat (translated as golden cape) made it to the list of the 10 most beautiful beaches in the world. It has a distinctive and recognizable shape, jutting out into the Adriatic with its stretch of pebbles like a golden tongue. The beach attracts many windsurfers and kite surfers due to the afternoon westerly winds that pass through the island. 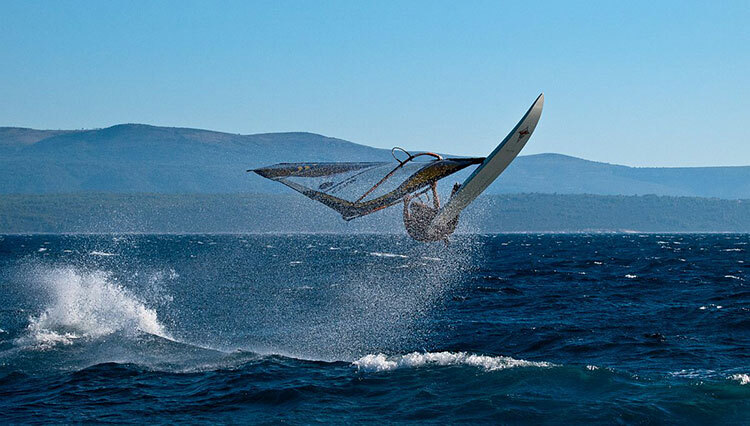 There are several clubs in Bol to help windsurfing kite surfing enthusiasts get equipment and even sign up for lessons. Brač is also well-known for its wine, fish, and olives. The olive oil in the island is of a rare variety called buhavica, which has been cultivated here since the Venetian times. You can enjoy these pleasures at fine hotels located on the island. Part of the Split and Dubrovnik Archipelago, Hvar is found between the islands of Korcula and Brač. 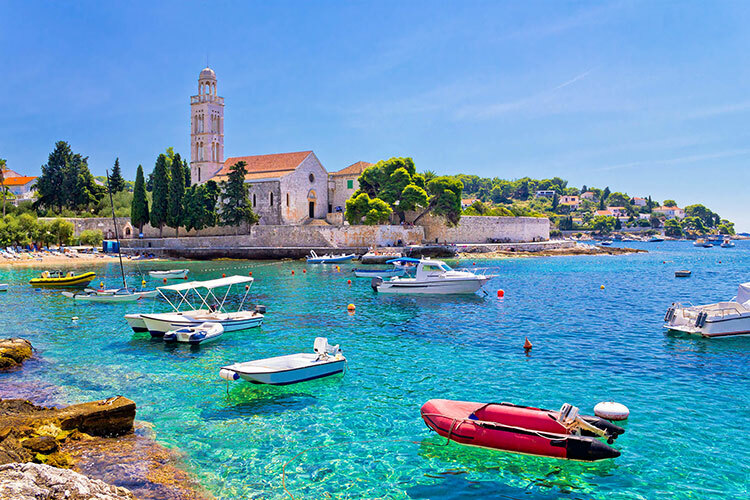 Hvar is known as the longest island in Croatia and has the moniker of being the island with the most hours of sun in Europe. It has a pleasant climate with lots of sunshine and very few rainy days. This island has a reputation of attracting the swanky set and is known as being the country’s coolest clubbing destination. Yacht owners spend their summers here moored in its pristine, blue waters. Since there are many well-heeled guests on the island, some restaurants and bars can have inflated prices. However, there are a number of budget-friendly private accommodations and hostels that cater to a younger crowd. Hvar Town is located on the southwestern coast and has a rich cultural and historical legacy. Within Hvar Town visitors will see a cathedral, a Franciscan monastery and fortresses on top of the hill. 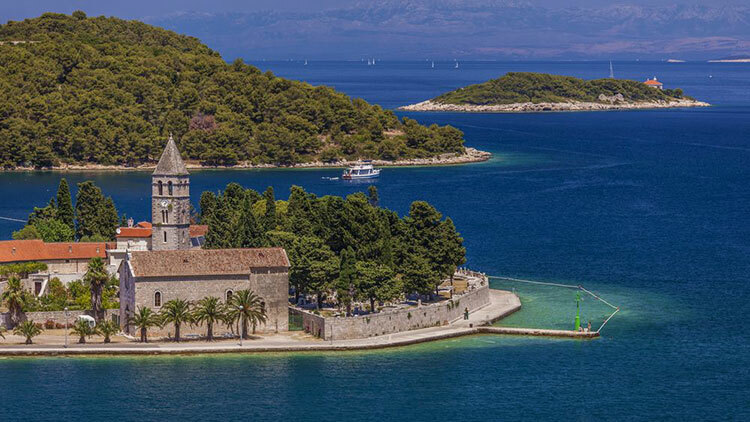 From these fortresses, visitors will catch a beautiful view of the Pakleni Islands and Vis. Hvar Town is known as one of the best places to have a good time and draws about 20,000 daily during the high season. Beyond the town centre filled with high-end establishments, there are other places to explore in Hvar. The island is rich with history, heritage, and culture. The old city of Hvar dates back from the 4th century BC, surrounded by medieval walls and Gothic palaces. Hvar is also very well known for its lavender and rosemary oils. The Stari Grad Plain, a beautifully laid-out pattern of olive trees set out by the early Greek colonists, is a UNESCO World Heritage Site. This is worth seeing because it has been perfectly preserved for the last two and a half thousand years. If you plan to visit Hvar, you can use ferry lines from Split, Rijeka. Zadar, and Dubrovnik. Vis has its own mysterious yet alluring vibe, being one of the farthest from the mainland of Croatia with an area of 90 square kilometers. For many years, it was out of bounds to foreign visitors because it was the army base of the Yugoslav Army. From 1950 to 1989, this tiny island was a military base under Communist president Tito. Thus, for many years, it remained unspoiled, with its residents relying on fishing and farming as its livelihood. There are a number of donkey tracks on the island that are ideal for exploring the small towns and villages. These days, tourism is definitely on the rise in this island on the Dalmatian coast. Visitors instantly fall in love with its remoteness and rustic charm, which has remained intact after all these years. Visitors enjoy a quiet day at its gorgeous beaches along the rough coastline, enjoying the sun. In fact, Vis has more sandy beaches compared to most islands in Croatia. Vis also offers superb gastronomic delights – simple pleasures such as freshly-caught sardines, fresh fish, or octopus. There are many small home restaurants on the island serving delicious local delicacies. They are best paired with local red and white wines. For centuries, Vis has been famous for its wine. They are cultivated on fertile valleys set amidst limestone hills. Since the island is located strategically in the Adriatic, it was fought over several naval battles throughout the years. Thus, Vis has an incredible history that dates back to Roman times. In the city of Issa, you can find an inscription by the Roman hero Calius from the 4th Century BC. This is considered the oldest verse in Croatia. There are various accommodations around the island, particularly around its two main settlements, Vis and Komiza. You can get to Vis through two ferries that sail to the island daily. Korčula is the second most populated island in the Adriatic, lying towards the southern part of the Dalmatian coast. The sixth largest island in Croatia, it is less than 100 kilometers from Dubrovnik. Korčula has been a favored Greek holiday spot 2,000 years ago. Its stunning architectural heritage can be credited to its long history of being part of the Republic of Venice in the 15th and 16th centuries. The narrow streets and alleys of Korčula are laid out in a herringbone pattern in order to protect it against sea winds. Korčula is famed for its crisp white wines, Grk and Pošip made from endemic grapes. 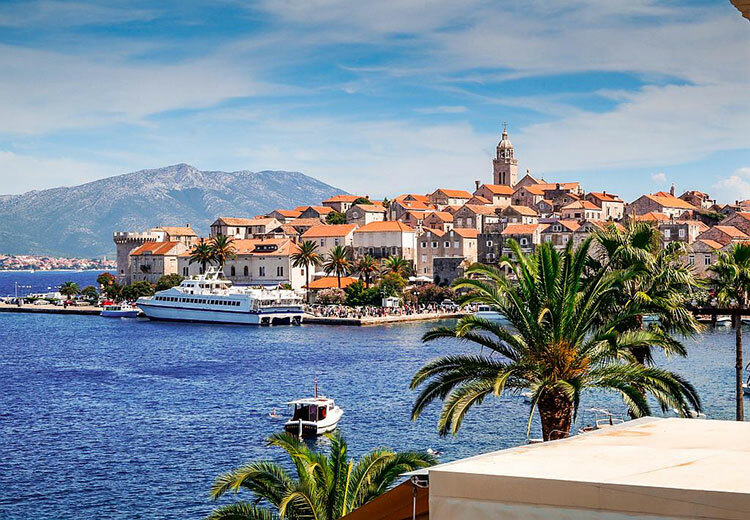 This island is filled with beautiful historical buildings, notably its formidable medieval walls, medieval white stone buildings, and St. Mark’s Cathedral which is found in the center of Korcula’s Old Town. St. Mark’s Cathedral was built in the 15th century. South of the cathedral lies Opatska Riznica or the Abbey Treasury. The town museum, once the palace of a local family, is located opposite the cathedral. Because of its similar architecture, Korčula is often dubbed as “Little Dubrovnik.” What the old Korčula town lacks in size, it more than makes up for the quality of its old buildings. Its 13th-century medieval buildings are very well preserved. 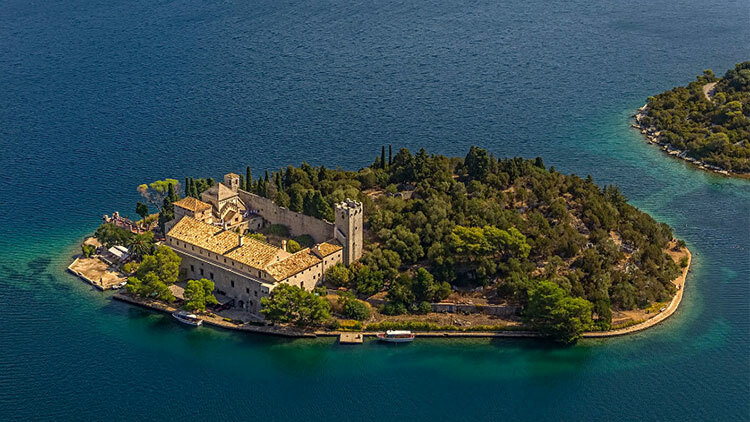 Many Croats claim that Marco Polo was born on this island, thus they created the Marco Polo gallery in his honor. Korčula is also very famous for its Moreska sword dance. Moreska means “Moorish” and it depicts the battle between the Moors and the Christians. The island is settled with quiet little hamlets and villages – mostly vineyards and fishing towns. The small fishing village of Lumbarda has sandy beaches – the only one on the island. Visitors can get to Korčula by ferry from Split and Dubrovnik. You can also get to Korčula by bus from Dubrovnik. The calm, rustic charm of Rab continues to seduce visitors to this island located in Kvarner Bay, off the northern coast of Croatia. Part of the Kvarner Archipelago, which stretches out from the north to the southern Adriatic, Rab is well-known for its great beaches and idyllic towns scattered all over the island. Rab has 30 sandy beaches with lots of tiny coves. There are seven great places on the island that is worth checking out: Barbat, Lopar, Banjol, Mundanije, Supetarsla Draga, Kampor, and Palit. Forking out into the Adriatic Sea, this island features sheltering ridges that protect the breathtaking beaches that remain untouched by the mountain winds. Rajska beach, which in English is translated to “Paradise Beach”, is ideal for families because of its sandy beach and crystal clear, shallow waters. 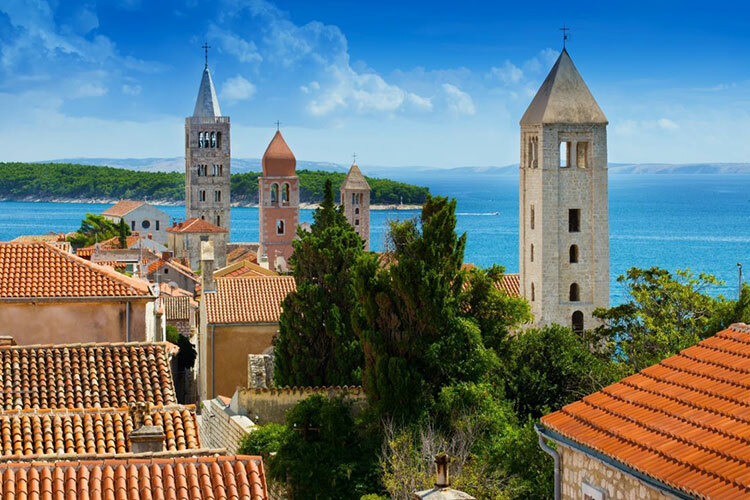 The town of Rab is bounded by ancient city walls and is instantly recognizable due to its four church towers. From afar, it depicts Rab as a ship with four masts. There are various places in Rab with cultural and historical significance such as the Cathedral of the Assumption of the Blessed Virgin Mary, the Monastery of St. Andrew, the bell tower and the ruins of the church of St. John the Evangelist, and many more. Rab’s tourism industry has been in existence for more than 100 years. However, Rab first became well-known in the world stage when controversial British royalty King Edward VIII took his new American wife Wallis Simpson to the island, way back in 1936. The story goes that the famous royal set off Rab’s nudist tradition by being the first to cast off his clothes and swim in the sea. Rab Town is one of the best places to stay if you love to party. The quiet island is swept up into a party atmosphere every summer, where visitors come from all over to partake in its infamous summer festival. Rab can be reached from the mainland through ferry. A good road with a reliable coach line also connects it to the mainland. One of the most beautiful islands in Croatia, Cres is a stunning island characterized by forests filled with oak trees, majestic cliffs along the coastline, and medieval hilltop towns. Located in the northern part of Kvarner Bay, Cres is the second largest island in the Adriatic. 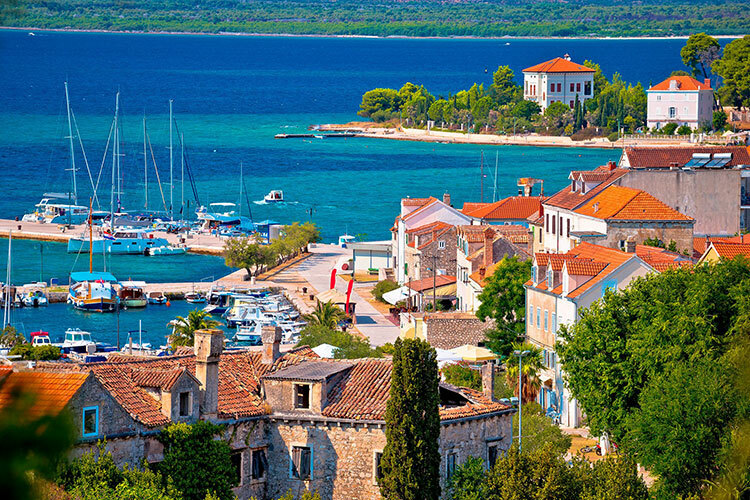 Cres is also known for its endless city walls and Renaissance-era churches and palaces. Lake Vrana, a freshwater lake that contains both carp and algae, is also one of the crowning glories of Cres. This natural phenomenon, found in the center of the island, is the largest natural lake in Croatia. The lake’s surface is above sea-level, and the water is drinkable. Lubenice Beach in Lubenice town has absolutely magnificent views and picture-book beauty. Lubenice town is also very special, as it is located on a cliff that is 382 meters above sea level. This picturesque town has medieval monuments and old stone houses, a stone fortification that is a fine example of typical rural Croatian architecture. Cres’ northern part is rich with forests filled with trees such as red oak, elm, and chestnut. Its southern part is covered in pastures and hills with evergreen coniferous forests. The island has rich flora, with more than 1,100 plant species. About 939 of these plants are indigenous to Cres. The island is also famous for being the breeding ground of the fearsome and extremely rare griffon, a mythical-looking vulture and one of the largest flying birds in the world. They build their nests on cliffs that overlook the sea. Griffon vultures start on the island of Cres and migrate across Europe, Asia, and Africa. One of the last habitats of the griffon vulture, Cres has two ornithological reserves on the east side of the island. The ‘Caput Insulae’ center features a recovery facility for injured or poisoned griffon vultures. The island of Krk is located in the Kvarner Archipelago, along the north part of the Adriatic Sea. Krk is home to some of Croatia’s best beaches. Beach bums enjoy Krk’s picturesque landscapes, natural bays, and sandy and pebbly beaches. Velika Plaza, one of Croatia’s most popular beaches, is found here. Velika Plaza, which means ‘big beach’, is mostly sandy. 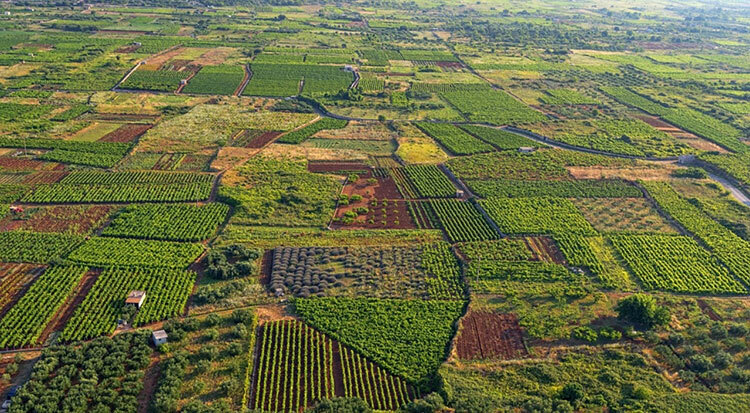 With 16,000 inhabitants, Krk has several industries including farming, wine production, livestock breeding, textiles, shipbuilding, and tourism. 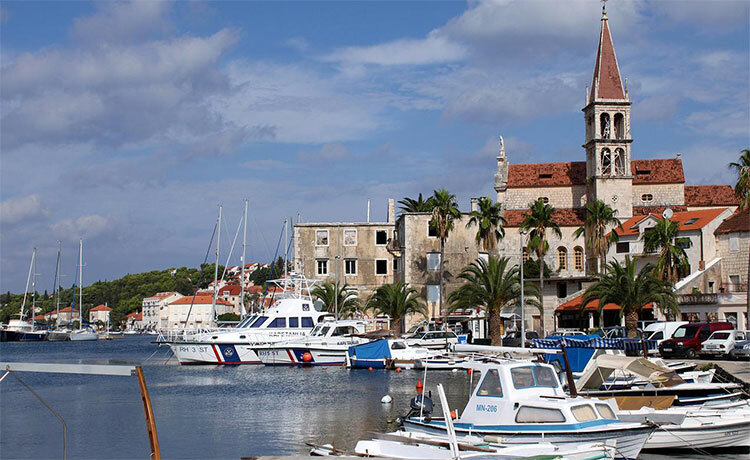 The interesting island of Krk is historically important for Croatian culture. Influenced by the Frankopans, which is the regional aristocratic family who ruled in the 13th and 14th centuries, the city has one of the oldest settlements in the country. It dates back to the Neolithic period, with pieces of evidence found in the caves along the Baska Cove and the Vrbnik Cove. History buffs will find this island very interesting because in the resort town of Baška the 12th-century Baška Tablet was discovered inside the church of St. Lucy. The Baška Tablet symbolizes an important piece of early Croatian literacy. It also boasts of ancient fortifications and monasteries. 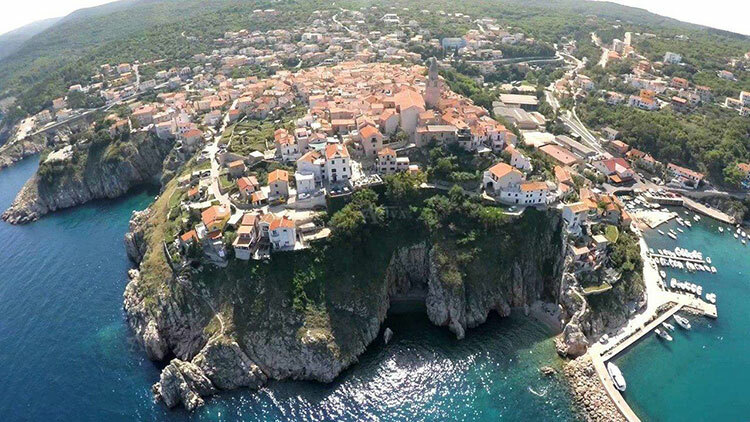 Off the coast of Krk is the tiny island of Kosljun, which is well-known for its isolated Franciscan monastery with a valuable ethnographic collection. There are several interesting monuments on the island, showing the gradual developments of architecture in Krk over the years. The early Christian, early Croatian, early Romanesque and late Romanesque periods are all represented in its various churches. Krk is also famous for its good wine made with the endemic Zlahtina grape. Krk is a very accessible island. It is connected by bridge to the Croatian mainland. Visitors can also use ferries. The international Rijeka airport with flights to and from Germany, England, Sweden, Israel, and other countries, is actually on the island of Krk. Pag has a rocky landscape; hence it is also called the ‘island of the moon’ or the ‘island of rock.’ Pag is an island filled with contrasts. This narrow island composed of two parallel mountain ranges is settled by local fishermen going about their daily business. The southwest coast is flat, and the northeast coast is steep and high. The commercial center of Pag is composed of narrow, fortified streets that date back from the Middle Ages. A 15th-century gothic cathedral is the center of attraction. In contrast, Novalja, one of its towns, has transformed into a resort town. A short bus ride from Novalja is Zrce beach, which is known as the biggest club hub in the country. Zrce is the place to be, with its open-air clubbing and its music festivals. Held yearly, the Hideout Festival is the biggest by far. Pag is famous for its cheese, salt, and sheep. Sheep from Pag only eat saline grass that grows exclusively on the island. Because of this, their lamb has a distinct flavor which is their signature specialty. Their famous cheese is made from the milk of these sheep. 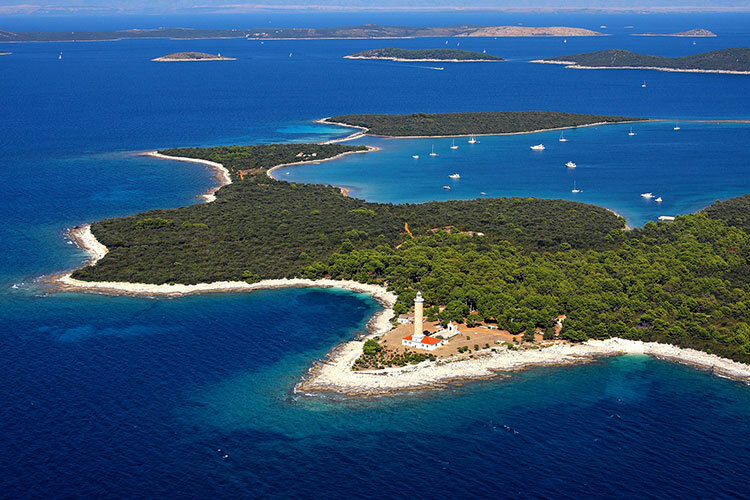 Most of the salt in Croatia originates from this island. Salt production is an important industry in Pag, dating back more than 1,000 years. The climate of the island is Mediterranean. The area of Luna is planted with a lot of olive trees, so olive oil manufacturing is also one of their main industries. One of the island’s most unique products is Pag lace. Protected by UNESCO, this unique art of lace-making produces a delicate but durable product that is the pride of the island. Pag is linked to the Croatian mainland by bridge. Visitors can also access the island by ferries. Dugi Otok is a very long bay, a natural extension of the Kornati Islands. Dugi Otok is for holidaymakers long for isolation and tranquility. If peace and quiet is your preference, then this island is the place to go to. Here you can enjoy the purity of the sea and the beauty of nature. Dugi Otok is an island of great natural beauty. It is perfect for swimming, trekking, riding a bike, walking, and fishing. 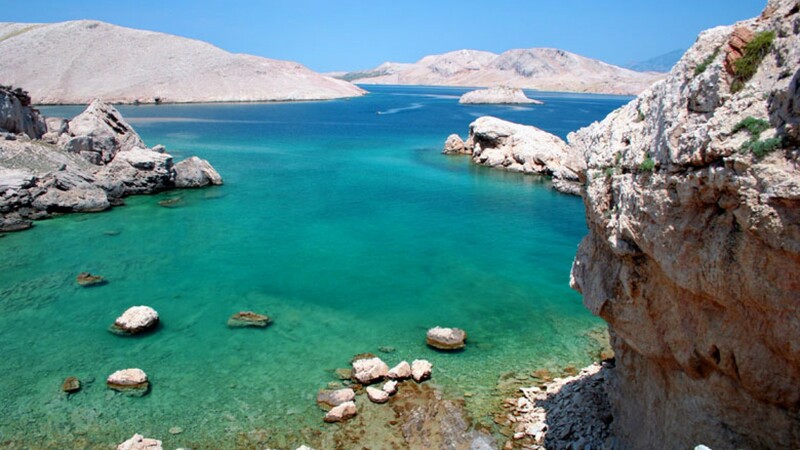 There are marked hiking trails and pre-arranged excursions to Kornati National Park, a protected area, and to Telascica Nature Park. Fishing is allowed all over the island except in Telascica Nature Park. Dramatic cliffs are found on the coastline of Telascica, while the southeast part of the island, there are quiet coves and Sakarun, a sandy beach celebrated for its white sand. In the area near Brbiscica Bay, visitors will find interesting karst formations such as sea flooded caves and passages. It is also a perfect diving area. Several diving schools in Dugi Otok offer diving excursions in this area. The lighthouse in Veli rat is found on the western part of the island. This beautiful lighthouse, considered one of the nicest in the Adriatic, was built in 1849 and is surrounded by numerous legends. There are 15 archaeological sites found all over the island, all of which have been clearly marked and supplied with information tables. Sali is the municipal center of the island and it also has the largest population. This is where visitors can withdraw cash at the ATM or avail of medical and dental services. There is also a post office and a Harbour branch office here. Dugi Otok is well-connected to the mainland by ferries and boats. Croatian villas have ideally decorated furnished interior, perfectly decorated exterior usually with a outdoor pool, beautiful panoramic surroundings and absolute privacy. Croatian villas are the most requested type of holiday accommodation in our wide selection of holiday rentals.